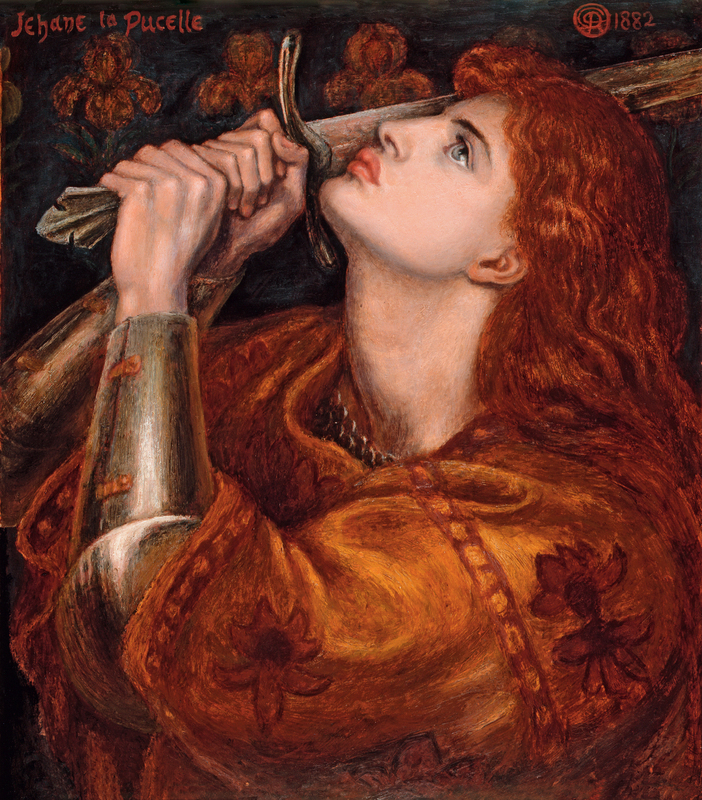 Joan of Arc, Dante Gabriel Rossetti, 1882. In Victorian thought, the book was an extension of both internal and external qualities, residing in the mind and in the physical world. Mass-produced art books (meaning mechanically produced) permeated the Victorian household, specifically the parlor, with their visuality, tactility, and even smell . The book’s domestic permeation also signifies its role beyond textual iteration, as an object in private space that can convey knowledge and beauty through sensation. A hierarchical system of senses was established in the nineteenth-century as conflicts between interior self and exterior conditions arose with urbanization, industrialization and colonization . Sight was (and continues to be) at the top of the hierarchy due to its relation to the scientific rationalism of the Enlightenment . Technological innovations continue to accommodate this superior sense (i.e. televisions), and the golden age of printing in the 1860s solidified the relationship between sight and logic, reason, and objectivity . Paintings similarly engage sight alone, and this was perpetuated by the nineteenth-century museum model—touching equated to ownership in nineteenth-century thought, and this idea also continues today . While a depth of meaning can be acquired through touch alone, it was still posited as a lower—even primitive—sense. Crafts are associated with touch, both in the action of the creation and the function of the end product. The Victorian book—and the Pre-Raphaelite book specifically—engages these two senses simultaneously, also in creation and use. This sensory rationale is the primary reason for its place between art and craft. Books are heavily visual, and thus relate to logic and reason, but they are also functional objects, created with the intention of tactile interaction. Their aesthetic values, perceived through vision, rely on their tactile function. Pre-Raphaelite images like Rossetti’s Lady Lilith (see "How Books Encapsulate Pre-Raphaelitism") and Joan of Arc ignore hierarchical viewing patterns, and in doing so, mirror the book’s displacement from the sensory hierarchy . In addition to the book’s material power, the contemporary writing and illustrations within these books also imagined and conveyed social possibilities—a better world . This idea aligns particularly well with the initial aims of the Pre-Raphaelites and their works: the embodiment of morality, piety, and purity through visual narrative . The Pre-Raphaelites believed their artwork could enact social change, or at least provide a moment of escape from modern society’s ills. The goal was for the viewers of these artworks to internalize and subsequently embody, their messages. Before the print revolution, poetry was revered as the ideal art to communicate morality, and poetry was inextricably bound to the book . The general role of the book in Victorian society, and particularly its link to the ‘inherently’ moral art, align with the Pre-Raphaelites’ aims for the canvas and beyond. Pre-Raphaelite philosophies closely mirror the existing conception of the book in Victorian society. The desire for morality in conjunction with the intense emotion in Pre-Raphaelite works also suggest an extension of emotion, accessible through the text and image on the page. These two media work together in the Moxon Tennyson. The multimedia book features Tennyson poetry and not that of the Pre-Raphaelites, but there were philosophical parallels between Tennyson and the group. They were so closely related that Pre-Raphaelite critic Robert Buchanan claimed that the Brotherhood imitated the great Tennyson, albeit through a lesser, morally corrupt art . 1. Colette Colligan and Margaret Linley, eds., Media, Technology and Literature in the Nineteenth Century, (Burlington, VT: Ashgate, 2011), 5. 2. William A. Cohen, Embodied: Victorian Literature and the Senses, (Minneapolis, MN: University of Minnesota Press, 2009), 1. 3. Mark Smith, Sensory History, (Oxford, UK: Berg Publishers, 2007), 19. 6. Lorraine Janzen Kooistra, Poetry, Pictures, and Popular Publishing: The Illustrated Gift Book and Victorian Visual Culture 1855-1875 (Athens, OH: Ohio University Press, 2011),42. 8. Jennifer Meagher, "The Pre-Raphaelites | Essay | Heilbrunn Timeline of Art History | The Metropolitan Museum of Art," accessed October 15, 2017, https://www.metmuseum.org/toah/hd/praf/hd_praf.htm. 9. Dennis Welland, The Pre-Raphaelites in Literature and Art (London, UK: George G. Harrap & Co. Ltd., 1953), 13. 10. Robert Buchanan, "The Fleshly School of Poetry: Mr. D.G. Rossetti," The Contemporary Review 1 (October 1871): 335.